Birch snowflake ornaments! This is the 3rd (and last) project in our mini-series of cool things you can make with a wood burning/etching tool. Project 1 is here. Project 2 is here. Birch trees are just lovely for the holidays. 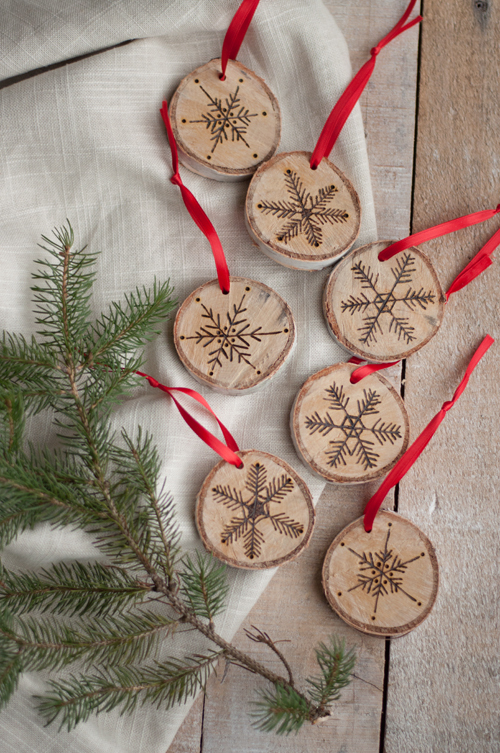 Paired with a slip of ribbon or twine, an evergreen bough or two, and these little ornaments will instantly give your home a rustic, woodsy, holiday feel, and have you ready to greet the first snowfall with a big grin. The interior of the birch branch was soft so etching was very easy and the process was very quick. And these couldn’t be more affordable to make! You could cover your tree with them. Or hang them on doorknobs around the house. You could give a set to your niece who’s just settling into her first apartment. Use them as gift toppers, or give them as holiday party favors! Don’t worry if drawing snowflakes isn’t your thing — feel free to copy mine! The designs I made are totally easy and simple to mimic. Flex those fingers and let’s do this. 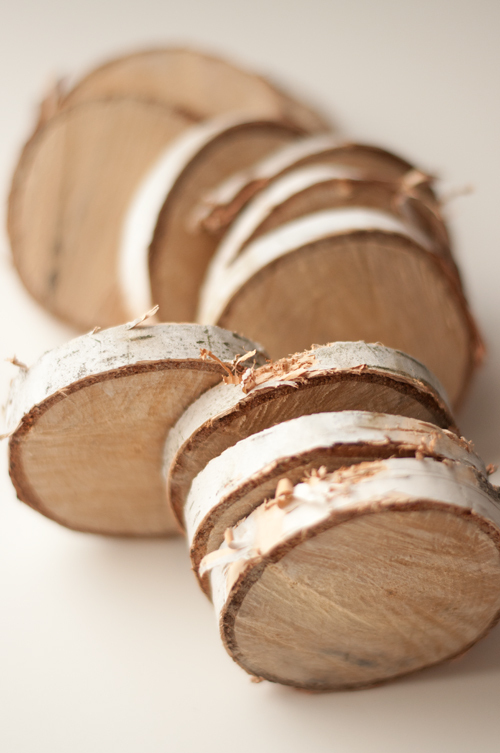 First thing to do is to cut the branch into slices, the width of which is your choice. Honestly, the bow saw made it through the branch really easily but if you aren’t up for sawing, look for a friend with a power tool and a willingness to assist you. Real birch does peel a little and the sawed edges were a bit rough so I rubbed them down with a rag towel to soften the edges. 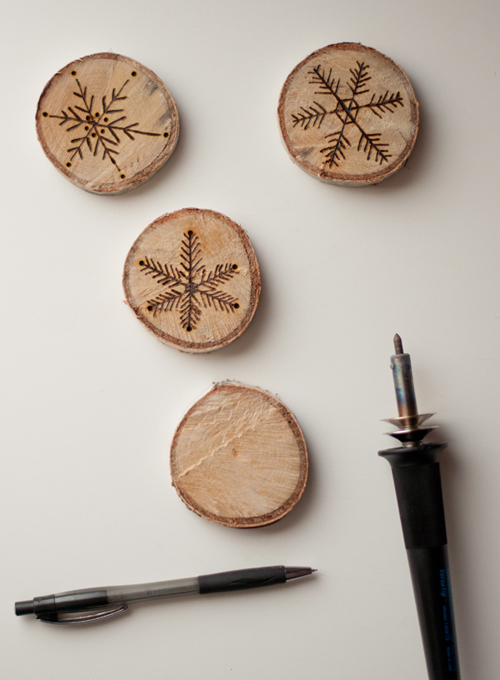 Use a pencil to draw the snowflakes on the cut pieces and then burn away. 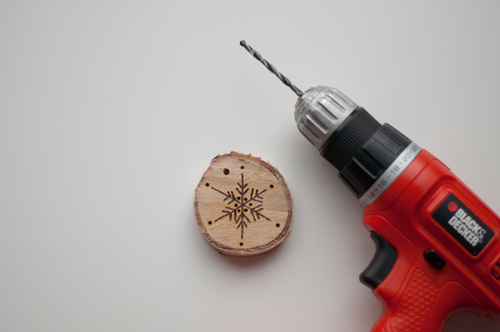 When the flakes are done, use the drill to make a hole for a ribbon. And finally, add the ribbon or twine to hang, and they are ready for the tree or gift topper. The red ribbon adds a very Christmas-y pop of color, but if you like a really natural tree, twine would keep the palette neutral. And that’s it. Easy as pie. 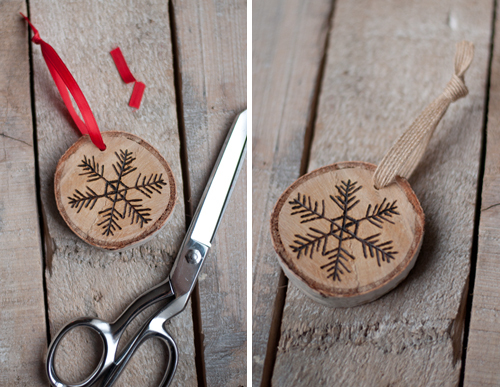 Just be sure to slice up plenty of birch, because these snowflake ornaments are so fun to make, you won’t want to stop. Speaking of which, don’t stop with snowflakes! You could etch any design you like. Wouldn’t a monogram be fun? – Creating a garland of snowflakes, or you could spell out Happy Holidays. – Party favors for your holiday party. Thanks for the inspiration and love from Germany!!! ADORE. I adore this Amy. Great job! Thanks for the great idea. We must have an etching tool around here somewhere…. i love them. They are so pretty. I’m going to have to get myself an engraving tool now with 3 such pretty crafts to do. I love these, but have no idea where I’d get a birch branch from. Any ideas for people who don’t happen to live in a forest? I want to know too. where do you get a birch branch from? Yes me too! where would one get this magical birch branch? awesome! love the ideas, Amy! Love! After this week, I am fully convinced I need a wood etching tool! I just tried this with a wood branch from a local park. Probably pine but I’m not sure. I used my soldering iron since I don’t have an etching tool. Not sure if it’s because the wood is harder than birch or if my soldering iron just isn’t up to the task but this didn’t work too well for me. I just couldn’t get the wood burning marks to be even. I felt like I had to press really really hard with the soldering iron which make the marks uneven and took way to much effort to get through one line. I’m going to go get a proper etching tool and try again. I’ll let you know how it goes. These are gorgeous. Such a great idea. I LOVE these etched wood ideas. So much fun and easy. I’ll have to get an etching tool. They’re pretty useful to have around anyway. I wonder if I can get my 4 year old to do it too! Very cute and creative! I like this. Is the little ornament heavy? Would a Christmas Tree have a problem holding it as an ornament? My mom saved a similar ornament like this from my childhood – I think it was a craft project but seeing this post brought back the memory! I’m going to make some of those to gift my friends!! It’s really original and it is so wonderfull, they will be amazed in christmas. 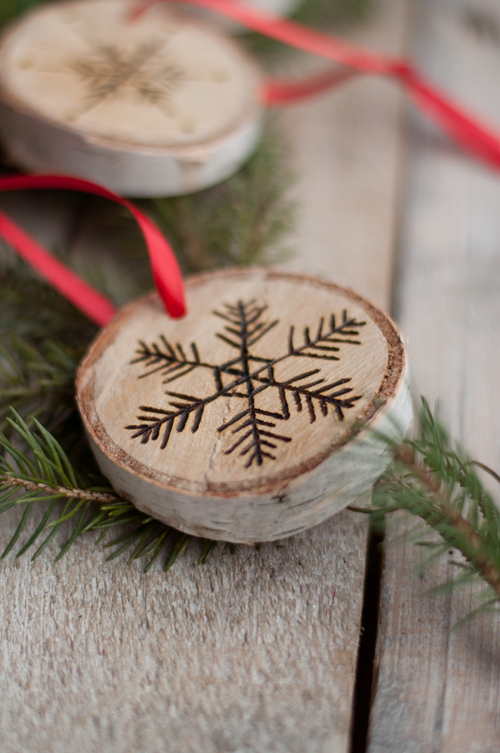 The Perfect Gift: Etched Snowflake Ornaments in Birch | The Makit Blog - The Original Make a Plate! I have not used my tolls for years, but this incredible idea was an inspiration for me. Thank you for that. Hi! Apologies if it is mentioned anywhere, but am i able to purchase these from you in any way? thanks! I’m thinking of cutting a slice off the bottom of our Christmas tree (and then continuing the tradition each year!) to make an ornament. Question – do you think some sort of protectant/shellack needs to be painted on to the wood, or will these last without anything? I want to do the exact same thing, and I have the exact same question! I am also wondering the best way to clean them. I had the slices cut when we got our tree, but they were cut with a chainsaw that got dirt all over them and now they’re pretty dirty looking! NAPCP » Countdown to Whistler: 2 Months! My craft store Joann sells birch branches during the Chirstmas season! 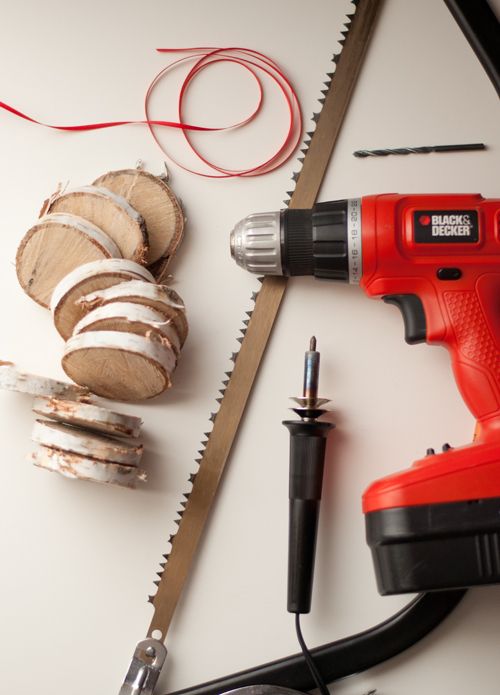 would my husband’s old wood burning kit work the same way? I love these but am wondering, as the wood discs dry do they split?